STAR-STUDDED RELEASE BRINGS MOVIE CHARACTERS TO CARDS. INSIGNIA PATCH CARDS INCLUDED FOR THE FIRST TIME EVER! 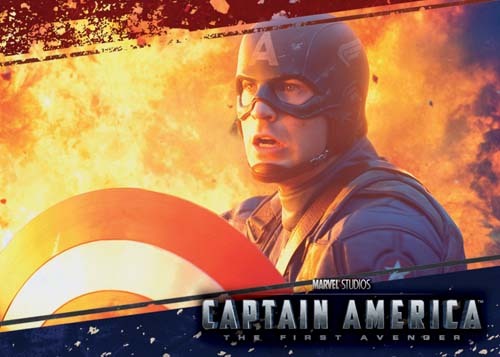 Carlsbad, CA (June 20, 2011) – This week, the Upper Deck Company, in conjunction with Marvel Entertainment, LLC, is releasing its much-anticipated “Captain America: The First Avenger” movie trading card set. Jam-packed with highly coveted cards showcasing many of the most memorable scenes from the upcoming Captain America: The First Avenger movie premiering on July 22, the base set consists of 86 movie plot cards, 12 character cards and one movie poster header card. “Captain America: The First Avenger,” directed by Joe Johnston, will focus on the early days of the Marvel Universe when Steve Rogers (Chris Evans) volunteers to participate in an experimental program that turns him into the Super Soldier known as Captain America. As Captain America, Rogers joins forces with Bucky Barnes (Sebastian Stan) and Peggy Carter (Hayley Atwell) to wage war on the evil HYDRA organization, led by villainous Red Skull (Hugo Weaving). One of a continuing slate of films being produced by marvel Studios based on the Marvel characters, “Captain America: The First Avenger” joins Thor which was released on May 6, 2011 and Marvel’s The Avengers which is coming to theaters on May 4, 2012. Topping the list of must-haves within the Captain America set is its phenomenal lineup of insert cards, including autographed cards from actors such as Kenneth Choi (“Jim Morita”), Stanley Tucci (“Dr. Erskine”), Toby Jones (“Arnim Zola”) and Neal McDonough (Dum Dum Dugan”). In addition, pieces of the costumes that were used in the movie have been embedded into movie memorabilia cards to bring collectors even closer to their favorite characters. Some of these items include costume pieces of both Steve Rogers and Captain America; Peggy Carter; and The Red Skull. The movie memorabilia cards will appear at an average rate of 1:48 packs. Another terrific chase element to the set includes its assortment of sketch cards from many of the world’s most renowned comic book artists including Charles Hall, Katie Cook, Eric Ninaltowski, Jonboy Meyers and Jim Cheung. Lastly, for the first time ever, Upper Deck has manufactured insignia patch cards featuring some of the famous uniform logos and patches that were most prevalent in the movie. There will be six different patch cards to collect including Red Skull’s Hydra Army patch! Upper Deck’s Captain America: The First Avenger Trading Cards boasts seven cards per pack, 24 packs per box, and is currently on store shelves. 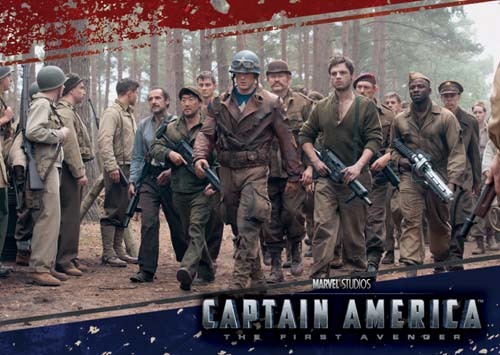 “Captain America: The First Avenger” will be distributed by Paramount Pictures.